I don’t know about you, but I’ve found myself praying for shade a lot this hot summer. I’m more grateful than usual when one of the rare spots under a tree in a parking lot is open. Clouds make me almost giddy when I’m out for a morning run. And I’ve even found myself thankful for a large truck’s shadow cast over my car while I wait at a traffic signal. But I’ll admit. Sometimes I forget to be grateful for these gifts of shade and comfort. Sometimes I’m stuck in a one-woman pity party, and I can’t see past my own bad mood to acknowledge all that’s wonderful around me. God had to know when He created us that we humans would tend toward pity parties. We have plenty of biblical pity parties to learn from, and in one of my favorites, God even brings a parasol to the party. A parasol for a pity party? You may remember Jonah best for his three days and nights spent in the belly of a giant fish, but he also throws one of the biggest pity parties you’ll find in the Bible. He’s a complicated guy (as many of God’s prophets are). The pity party in his story comes after he has already survived the storm at sea, the fish ordeal and his time walking through Nineveh preaching to a foreign people (who quickly repented and not only fasted and covered themselves in sackcloth but also covered their animals and withheld food and water from them). Here’s the complicated part. Instead of Jonah rejoicing that the Ninevites heeded his warning, he gets mad at God for deciding not to destroy Nineveh. He’s so mad that as he leaves town, he asks God to let him die (Jonah 4:3). He sets up a little shelter on the outskirts of the city to see what will happen, and there, he proceeds to pout. I want you to really see Jonah sitting there. Imagine the frown on his face, the tightly crossed arms, the rocking back and forth in anger that won’t let him be still, the sweat pouring from him because of the weather. when dawn came the next day and it attacked the plant and it withered. There are several reasons God caused the vine to grow up as a parasol to shade Jonah. First, God wanted Jonah to know He still cared him and wanted to comfort him. He knew that one of the reasons Jonah was pouting was fear. You might think that a man who had survived being swallowed alive by a fish would have learned how to overcome his fears and trust God to protect him, but instead, Jonah was eaten up with fear. You see, he didn’t understand that God’s love was great enough to include any number of people and countries. Jonah thought that God’s decision to save Nineveh meant that Jonah’s own people would no longer be God’s special “chosen” people. God was trying to correct this wrong thinking by sending the vine to provide shade for Jonah. But Jonah kept pouting, and so God took the parasol away. There are times God will comfort us in our pity parties, as He did with Jonah’s first day at the outskirts of Nineveh, but He doesn’t want us to set up camp in those unhappy places. And so He will nudge us out of them. That’s what he was doing by having the worm destroy the vine and by turning the next day even hotter. Jonah still wasn’t learning the lesson, though, and so God spoke to him. Jonah’s anger was unjustified, ridiculous and possibly even puzzling to God. I mean, here was a prophet whose mission had been a success. But he was so wrapped up in himself that he couldn’t celebrate with God in joy over the salvation of 120,000 people plus all of their livestock. God was urging Jonah to learn the lesson of compassion, to step outside of his own selfish thoughts and enjoy what his obedience to God and his labor had achieved. And so it is with each of us. There’s always room for compassion. There’s always a reason to celebrate God’s blessings toward others. Sometimes, it takes losing the parasol at our pity party to jolt us into looking beyond our own thoughts and fears and misunderstanding to learn what is most important to God. God has the last word in Jonah’s story. So we’re not sure what happened to Jonah after this encounter. I like to think he walked back in to the city and celebrated at the Ninevites’ joyful party. Stuck in your own pity party? Can you relate to Jonah’s story? Have you ever gotten stuck in a pity party? What parasols have comforted you during this tough time? What blessings might you find as a result of setting the parasol aside? If you have a story to share about coming out of your own pity party and the blessings you found on the other side, I’d love to hear it! This entry was posted in flourishing tree and tagged compassion, gratitude, hope, Jonah, nature, pity party, summer by hopesquires. Bookmark the permalink. I really love this post and all the incredible word choices and pictures. I’ve always kind of gotten a kick out of Jonah and this makes it even more alive for me. Thanks Hope! Tricia — thank you so much for your comment. Jonah’s one of my favorite “characters” of the Bible, and I’m so glad I could make his story come alive more for you through this post. The photo came about from divine providence (no kidding). While preparing yesterday’s post, I started wracking my brain to figure out where I could get a parasol to photograph. 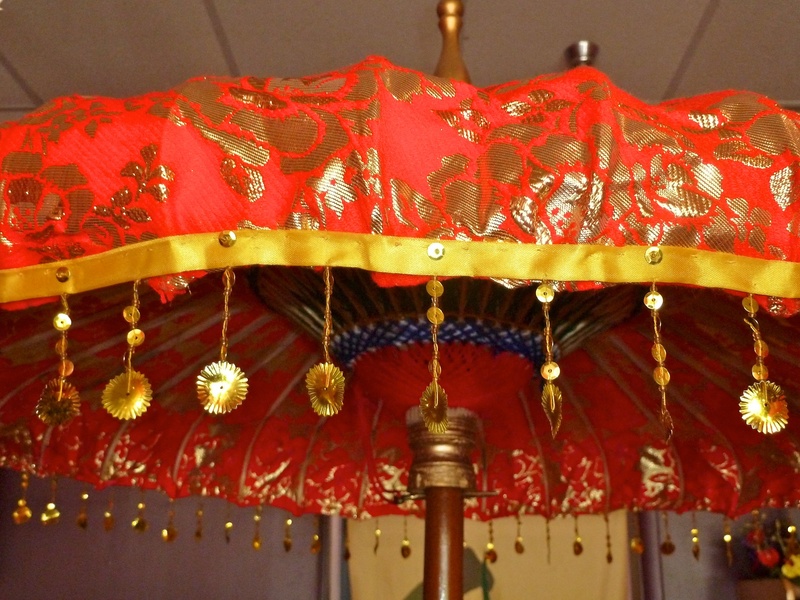 I met some friends for lunch at one of my favorite Thai restaurants, and when I walked in, there stood this lovely red and gold parasol by their counter. I like to think that God chuckled a little bit at my delight and even arranged for one of my friends to have her camera with her. Great teaching, Hope! God has turned my umbrella inside out quite a bit and I deserved it every time. The biggest culprit, when I’m going through a trial, is forgetting all the ways I’ve been delivered and blessed in the past. Your comment “I deserved it every time” made me laugh. One of the greatest benefits of keeping a gratitude journal has been the frequent reminders that even though my life isn’t perfect, God has richly blessed it nonetheless.